Back by popular demand, we’ve decided to offer our Free Bacon (or Links) One-Day only promotion every so often. Now we know you’re excited to hear that, but try to keep the cheering down, because we’ve got some info about it that we want to share. We keep the dates of these super special sales as secret as our 150 year old bacon recipe, so you’ll definitely want to be sure you’ve subscribed to our newsletter, that way, you’ll be the first to know when we announce it. Because if you miss it, you miss it, and you’ll just have to cry yourself to sleep knowing you came oh so close to scoring free Naked Bacon. And when you get the email, you know it’s go-time. Hurry up and make your purchase! 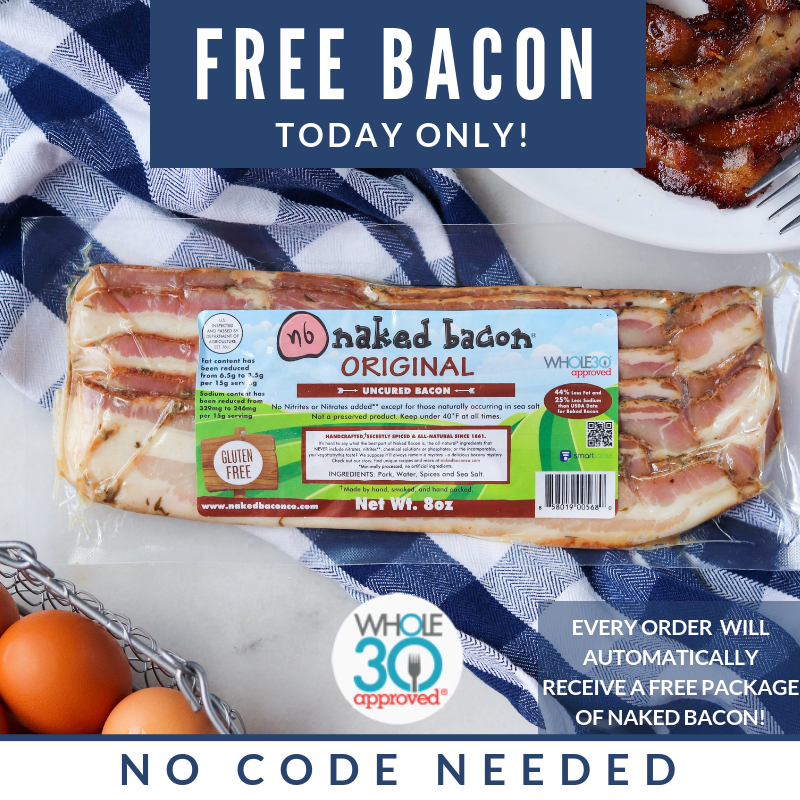 There’s no code needed, you’ll automatically see “Free Bacon Day” or “Free Links Day” with a 1 cent discount when you check out, then you’ll automatically get it included with your shipment! And just so you know, certain terms do apply to this promotion. First, it’s a one-day only sale, so the offer expires at midnight. Second, it’s not valid on purchases of gift certificates or tee shirts. And one last thing - it can’t be combined with other discounts. You’re welcome to take advantage of any other promotion we’re running instead, but if you enter a separate coupon code at checkout, it’ll replace the Free Bacon or Links offer. Do you have questions? Let us know & we’ll be happy to answer them! Always feel free to reach out to us on Facebook or Instagram at or Customerservice1@nakedbaconco.com.